Fight like a girl! : I may be speaking a bit too soon..... but chemo doesn't seem that bad! I may be speaking a bit too soon..... but chemo doesn't seem that bad! Last week was eventful to say the least, when I returned home from hospital I was starting to feel full of energy and had an insatiable appetite (making up for lost time! ), unfortunately I started to feel thoroughly rubbish on Saturday; I was exhausted and freezing cold, after spending much of the day with numerous layers and wrapped in blankets we finally had the bright idea to take my temperature and realised that things weren't Disney. Northampton A&E were brilliant and rushed me through so that I could get hooked up to an IV and antibiotics, it turns out that I had an infected seroma which is where fluid from the last operation had become infected - bad news for a weakened immune system. 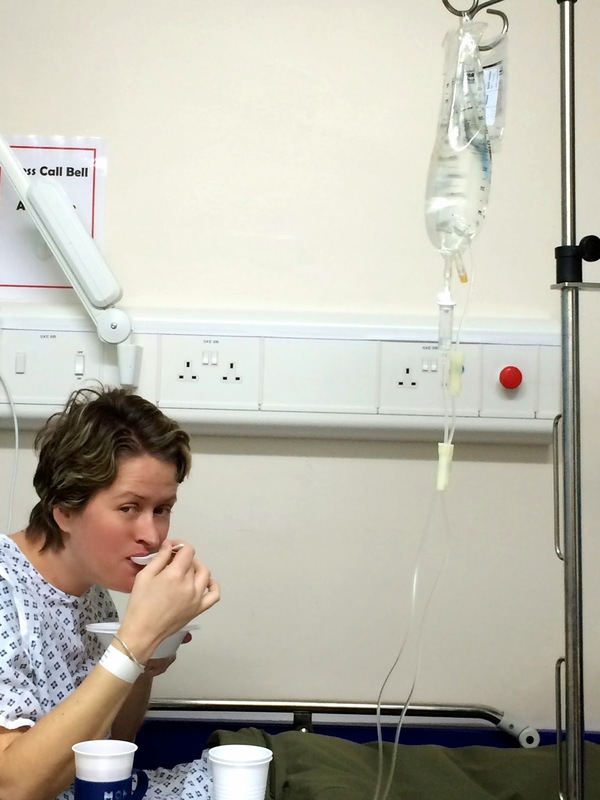 Thankfully this time the expulsion of bodily fluids were kept to a minimum and the brilliant A&E staff brought cornflakes and tea to stop me whinging about the hunger! My ever-sympathetic husband made many attempts to take a photo of me sitting on the commode while hooked-up to oxygen and the drips but mercifully the monstrosity you see here is as bad as the evidence gets. As I had an infection I was lucky enough to have my own room on the ward and enjoyed my bedside visit from Dr Bliss, she diagnosed an "owie foot" and promptly ordered me out of the bed so that her dolly could receive the urgent treatment that she required. I managed to leave hospital with Erica and Nathan the following day with a course of antibiotics to keep the nasties at bay. The irony of it all is this: when I'm not having an overreaction to the drugs or fighting an infection I feel brilliant, it's not bouncing off the walls brilliant but I have a decent level of energy and feel pretty good about things. I've started working from home again this week and am planning some ventures out to stores to spend some time with my team as I think my incessant phone calls are starting to become a nuisance! The week would be normal if it weren't for a visit to the cardiovascular surgeon tomorrow to insert a portacath into my chest, in a surreal way I'm looking forward to it so that my arm can start to heal as it is starting to look like it belongs to a heroin addict.